She's gorgeous, just love everything about her, especially her hair. You are an artist you know and if she was for sale this is one I would be buying! Anna is gorgeous and I am very envious of her hair - wish mine had so much body! Mmmm... mint choc chip! Oh Chris this is beautiful. You do such lovely work. Can't believe we are almost at week 3. Hannah is just amazing!!! so pretty!! This looks amazing.. You did such a great job..
Oh Chris she is darling. Wonderful drawing in my favorite color. She looks awesome ...especially her cute smile and the twinkle in her eyes ! She is so cute, and her hair looks amazing! She is fabulous. 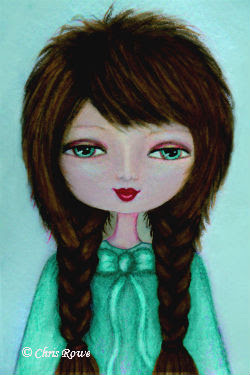 I'm especially amazed by her eyes and her hair...amazing texture in her hair..
One of my favorite pieces! I love her sweet face. Mmm, wish I had her hair..and some mint ice cream! LOL! Fabulous!